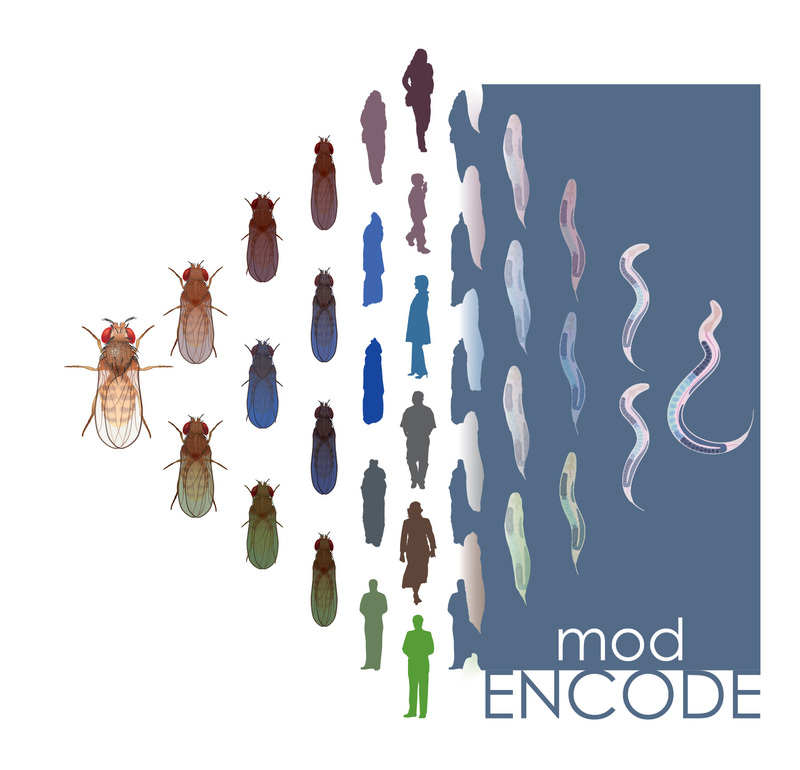 Data are available for the following papers of the ENCODE/modENCODE publication release. Members of the consortium have published several companion papers related to the three studies above. Brown et al., Diversity and dynamics of the Drosophila transcriptome, Nature 512:393–399, 2014. 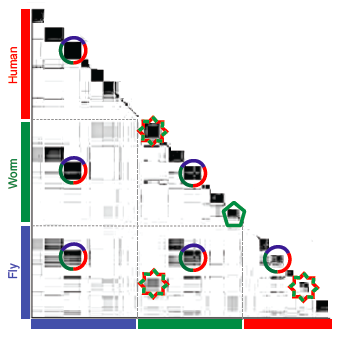 Araya et al., Regulatory analysis of the C. elegans genome with spatiotemporal resolution, Nature 512:400–405, 2014. Li et al., Comparison of D. melanogaster and C. elegans developmental stages, tissues, and cells by modENCODE RNA-seq data, Genome Research 24:1086-1101, 2014. 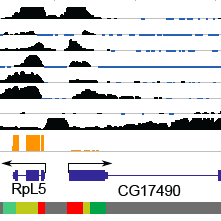 Lubelsky et al., DNA replication and transcription programs respond to the same chromatin cues, Genome Research 24:1102-1114, 2014. Arthur et al., Evolution of H3K27me3-marked chromatin is linked to gene expression evolution and to patterns of gene duplication and diversification, Genome Research 24:1115-1124, 2014. Chen et al., Comparative validation of the D. melanogaster modENCODE transcriptome annotation, Genome Research 24:1209-1223, 2014. Slattery et al., Diverse patterns of genomic targeting by transcriptional regulators in Drosophila melanogaster, Genome Research 24:1224-1235, 2014. Chen et al., Extreme HOT regions are CpG-dense promoters in C. elegans and humans, Genome Research 24:1138-1146, 2014. Wen et al., Diversity of miRNAs, siRNAs, and piRNAs across 25 Drosophila cell lines, Genome Research 24:1236-1250, 2014. Kudron et al., Tissue-specific direct targets of Caenorhabditis elegans Rb/E2F dictate distinct somatic and germline programs, Genome Biology 14:R5, 2013. Lee et al., DNA copy number evolution in Drosophila cell lines, Genome Biology, in press, 2014. Sturgill et al., Design of RNA splicing analysis null models for post hoc filtering of Drosophila head RNA-Seq data with the splicing analysis kit (Spanki), BMC Bioinformatics 14:320, 2013. Bolye et al., Genome-guided transcript assembly by integrative analysis of RNA sequence data, Nature Biotechnolgy 32:341-6, 2014. Mohammed et al., The impact of age, biogenesis, and genomic clustering on Drosophila microRNA evolution, RNA 19:1295-308, 2013. 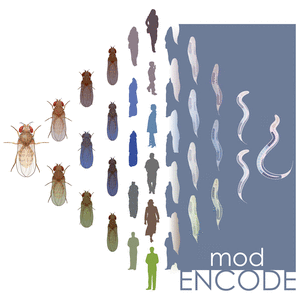 Trinh et al., Cloud-based uniform ChIP-Seq processing tools for modENCODE and ENCODE, BMC Genomics 14:494, 2013.